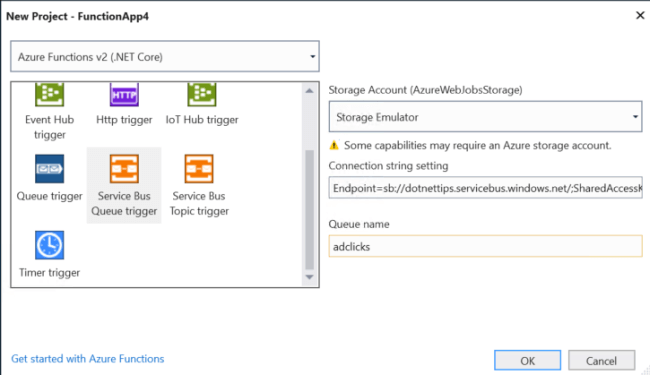 In this fourth part of the series, I will focus on the queueing using the Azure Service Bus and microservices using Azure Functions. For years, I have been talking about using queues on both the client side and server side, to increase the speed of processing and the user experience. In this app, I will be adding event information from my WinForms app to the back-end for evaluation every time a user clicks on an advertisement link. Using a queue dramatically increases this speed since no processing of the data is done when it’s added to the queue. Then a microservice, in this case, an Azure Function, will be triggered each time data is added to the queue. The function will then save the data into Cosmos DB. As you will see, using Azure Functions makes this process incredibly easy. In a contract worked on last year, I was able to decrease the time it took to process the data from a mobile client to the back-end from 7-70 seconds to under 500 milliseconds using queues and microservices. I discuss this more in my article titled “Are Microservices Just a New Marketing Term”. During the setup, I chose the following options. To secure the sending of items into the queue, I configure a Shared Access Policy that only allows sending. Later, when I wire up the client app and the user tests, I will use the Primary Connection String to connect to this queue. An example of the AdClickMessage data serialized to JSON looks like this. 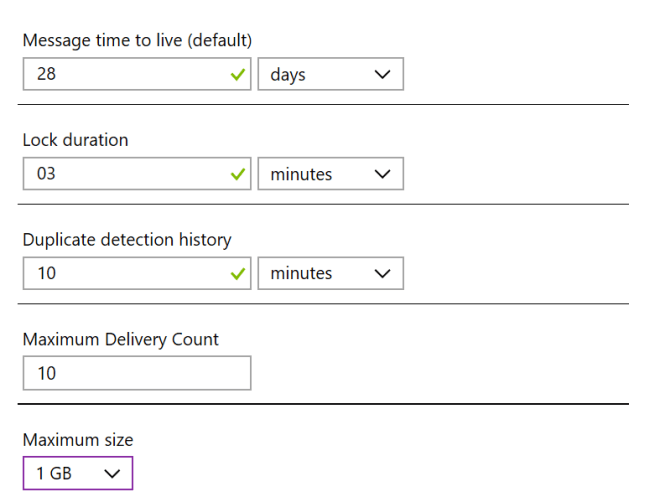 Creating a Function App in the Azure Portal is straight forward. I created one called “dotNetTipsAppAdsFunctions” along with a new Resource Group and Storage Plan in the West US 2 location. The rest of the settings I left as default. Afterwards, I did configure Application Insights, so I can view traces, performance metrics and issues. queueItem: The ad click data from the Service Bus queue will be sent in this parameter as a string. Deploying simple Azure Function like this is easy using Visual Studio. First, go to the Function App in the Azure Portal and download the publish profile. The right mouse-click on the project and select Publish. In the “Pick a publish target” window, select Import Profile and select the profile that you saved. At this point, Visual Studio will perform the first deployment of the function. I then go into Profile Settings and select the values shown in this graphic. After that, I then go into Manage Application Settings and configure the settings for AdsCosmosDBConnection and ServiceBusQueueConnectionString. Then, I hit "Publish" which will build the project again and deploy it to Azure. As soon as that is done, which only takes a few seconds, the function is running! Since I setup Application Insights for this Function App, it’s easy to monitor it, including errors. 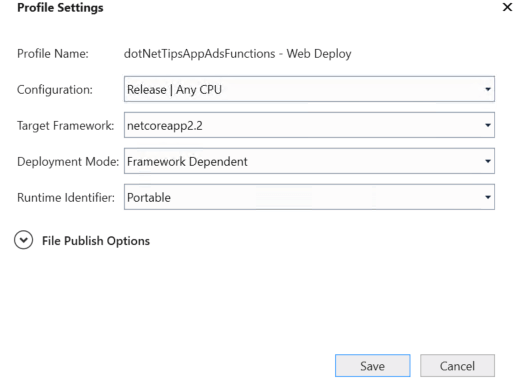 In the Azure Portal, I go to Application Insights and navigate to dotNetTipsAppAdsFunctions. After selecting this I can then drill into features such as metrics, failures, performance, search and more. In Search, I can easily see a graphical view along with information for exceptions, trace, dependency events and more. 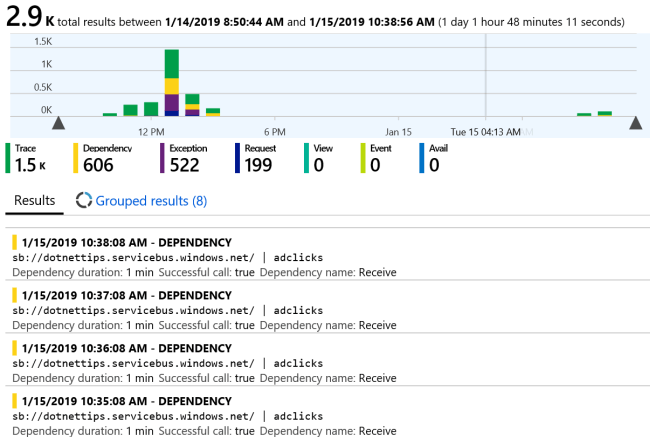 I also had an issue with the unit tests when using the connection string for the service bus from the Azure Portal. The Primary Connection String is incorrect when using the Service Bus in C#. 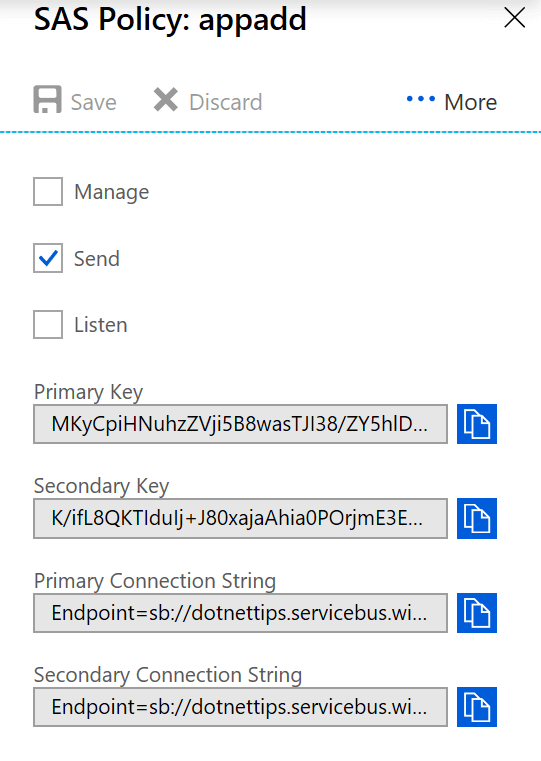 From the portal, the Primary Connection String looks like this: Endpoint=sb://dotnettips.servicebus.windows.net/;SharedAccessKeyName=SendPolicy;SharedAccessKey=Prbum/XZNcNeaCwQ=;EntityPath=adclicks. But this does not work until EntityPath is removed since that is a different parameter when connecting to a queue. When tried to test processing the data from the queue to the function, it took me a while to figure out how to add test messages to the queue (not using a unit test). First, I went to the Portal and there is no way to do it there. I then fired up the Azure Storage Explorer, but for some reason, it does not support Service Bus (something they REALLY need to fix). I then just relied on firing off my unit test that adds an ad click to the queue. The Visual Studio add-in for AWS makes adding and deleting messages very easy. I tried to update my Newtonsoft.Json NuGet package to the latest version. This caused lots of build issues since one of the NuGet packages in the solution supports only an older version. So, I had to back it out and keep the 11.0.2 version. I call this “living in NuGet hell”. I decided to use a ServiceBus queue instead of a normal Azure queue since it has more capabilities. Learning curve aside, creating and working with queues and microservices is so much easier in Azure when compared to AWS. Whether you are on the Microsoft stack or not, your team needs to spend time looking into it on Azure. I would also seek out developers that have used both for their opinion and guidance. Cost numbers on a spreadsheet do not tell the entire story! If you are looking at orchestrating (tying together in a workflow) your microservices, then Azure durable functions are hands down the way to go! I want to write an article on them later since they overcome most of the complexities that I guarantee you will encounter if you choose a cloud service other than Azure. Source for this solution can be found here. Utility Dev App - This is the app I will be connecting to this cloud app at the end of this series. I hope you will check it out.